Week Past, Week Ahead: Syria — A Regime Turning Point in Aleppo? Not Quite. Syria’s regime won the media battle last week with the breaking of the year-long insurgent siege on the Aleppo Central Prison, but does that translate — just before President Assad’s re-election — into “winning the war”? 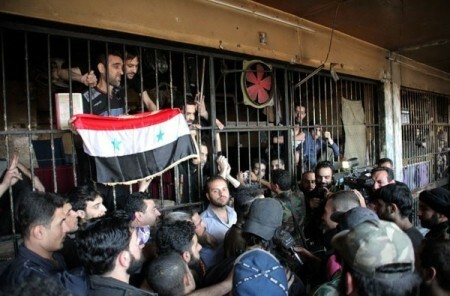 The Syrian military reached the Prison on Wednesday after opposition fighters finally withdrew under sustained bombardment. Video and photos showed a prominent commander greeting emaciated soldiers as troops celebrated amid the thousands of prisoners, many of whom are said to be at risk of death. The images were a further boost to the Assad regime after its recent deal to reclaim insurgent-held areas of Homs; however, it is yet to be seen if the victory is one of substance as well as symbolism. In and near Aleppo, Syrian forces are hoping to now move to the west of the Prison on areas such as Hraytan, cutting off supply lines to the insurgent-held eastern section of Syria’s largest city. That offensive has yet to materialize, and the regime is still under pressure in northwest Aleppo, where insurgents have gradually advanced and threatened their own siege of Syrian forces. Beyond Aleppo, insurgents are claiming a significant victory. The Islamic Front and Jabhat al-Nusra launched a major assault in Idlib Province in northwest Syria on Sunday, taking a regime bases and threatening some of the remaining checkpoints in the south of the province. Insurgent success could cut off the regime’s land routes from Damascus to Aleppo and from Idlib to Latakia on the Mediterranean coast. Trying to counter recent insurgent advances in the south, Syrian forces are still fighting near Nawa, a key link between Quneitra and Daraa Provinces. In central Syria, they appear to be stalled in their attempt to take Morek, on the highway from Hama to Idlib and Aleppo Provinces. Meanwhile, the daily toll of deaths from aerial attacks and rockets continued. The regime carried out barrel bombings across the country, while insurgent rockets and mortars killed scores, including 39 people in an Assad election rally in Daraa. At the United Nations, Russia and China vetoed a Security Council resolution for the fourth time since March 2011. In this case, the measure would have referred the Syrian conflict to the International Criminal Court. The Syrian military’s breaking of the insurgent siege on the Aleppo Central Prison removed a long-standing threat, as well as giving a PR boost to the Assad regime at home and abroad. However, at this point, it only counters the insurgents’ own campaigns, notably in northwest Aleppo. To break the 22-month stalemate, Syrian forces now have to claim territory to the north and east of Aleppo, choking the insurgency inside the city. While there were reports last week of regime success in the Sheikh Najjar area to the east, the Syrian military has yet to establish control of the area. And Aleppo cannot erase the problems for the regime elsewhere. Indeed, by Sunday, the insurgent success in Idlib Province promised to eclipse the regime’s celebrations. If the opposition can erase the last regime bases in the province, reducing Assad “control” to the cities of Idlib and Ariha, then Damascus may face isolation from its remaining forces in the west and north of Syria. Complicating any proclamations of “victory” — and further confirming the “patchwork war” — is the fight in eastern Syria. The conflict is now a four-way contest between insurgents, the Islamic State of Iraq and as-Sham, Kurdish militias, and regime forces. While the battle between the insurgency and ISIS has offered some hope for the Syrian military, which had been expelled from much of the area, it is too early to say that the regime can re-establish a significant presence in Deir Ez Zor and Hasakeh Provinces outside cities. Videos: New Regime Chemical Weapons Attack on Kafrzita in Hama Province? Can Regime Now Pursue “Victory by Siege” in Aleppo?